What is there to do besides watch the Auburn Tigers on a Saturday? Well, it’s festival season and on October 10, the first by weekend of the season, head to Waverly, Alabama to get your boogie on and eat some southern food at the South’s premiere multi-cultural music and arts festival, Fall 280 Boogie. This will be the 4th year for the Waverly Fall Boogie, a spin-off of the spring Old 280 Boogie that has been a hit for the past 15 years. “One of our slogans is, ‘Once a year is not enough,’ so we decided to have one [festival] in the fall too,” said Scott Peek, one of the founders of the design and silkscreen print shop Standard Deluxe that hosts both of the festivals. Both of the fall and spring festivals are about the same as far as what to expect at each one, but they each have different bands and vendors. 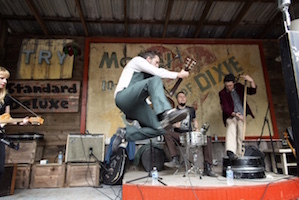 The Pine Hill Haints, one of the headliners in this year’s Waverly Fall Boogie, has played in the Old 280 Boogie 14 out of the 15 festivals. Other headliners include New Orleans singer Maggie Koerner, Natural Child, Larry Mitchell Band, Tim Lee 3, and Jake Fusell. To keep your dancing energized throughout this long day, there will be plenty of food vendors such as Johnny Brusco’s Pizza, Chris’ Hot Dogs, Kowaliga Restaurant, Mama Mocha’s, Perch, and Hornsby Farms. The art vendors will include Silas & Miri, Michael Foster Tintypes, Anthony Tavis Art, Loyal Stricklin, Alex Smith Art, Kim Davis Boogie Body Art, Drey Sett Nest, and Art by Redbird. Tickets for the Fall Boogie are $20 in advance, $25 at the door, and children 14 and under are free. The following businesses will be sponsoring the event: Wickles Pickles, Wood Studio, This Is American Music, Goodwyn l Mills l Cawood, Good People Brewing Company, Cottonseed Studios, Southern Makers, The Bitter Southerner, Standard Deluxe, and Willie’s Cycle Salvage.